I was somewhat alarmed by the first part of this enjoyable book. It was the Publisher's Disclaimer which said that Halsgrove had on many occasions disowned the author before continuing that " ...the views expressed herein arise entirely from the fevered brain of Mr Wood who remains entirely responsible for them, the Publisher is pleased to say." I wondered what on earth I had let myself in for but need not have worried as I have been told that Charles Wood is very well-received within Halsgrove! 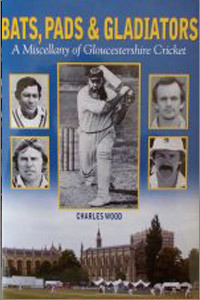 He has written quite a number of books on Somerset including a similar one to this book on Gloucestershire Cricket. Charles appears to have had an interesting life having worked in the legal profession, worked in Libya and Hong Kong, become a self-taught documentary filmmaker and also worked as a cameraman before becoming a writer. His enthusiasm for cricket is infectious as can be seen through this miscellany on Gloucestershire Cricket. Bats, Pads & Gladiators is not a history of Gloucestershire Cricket but more a series of anecdotes drawn from interviewing such people as Peter West, "Bomber" Wells and more recent Gloucestershire stalwarts including David Graveney and Andy Stovold amongst others. The reader will find many amusing anecdotes about The Shire ( Gloucestershire) and their rivals down the M5, Zum ( Somerset). The tone of this entertaining book became apparent early on with a story about Gloucestershire player, Jack Crapp, sharing a room with one of the Bedser twins during his England days. As the author writes " After last orders and probably a mite guddled, he returned late one evening to the hotel foyer to ask for his key. Before he could verbalise his request the receptionist asked, "Bed, sir?" "No, Crapp, " retorted Jack and was promptly guided in the direction of the 'gents'. This appears under A Much Told Story and has probably been told in many different ways but it does give the reader an idea of what to expect. Another hilarious article tells of the occasion, possibly apocryphal as the author did his own research into it, when Bomber Wells accepted a cup of tea from a spectator and found himself unable to give the cup back in time as a catch came his way. It stuck in the one free hand but Bomber was threatened with a two match ban for moving from his original position. Gloucestershire's fortunes may have dipped recently but some diehard supporters are followed which shows why some people so love county cricket and there is one particularly interesting piece about what happens off the field. Booksellers who try to enhance their living by selling books at county matches and what spectators get up to during a day’s play and an idea of their conversations. There are some scorecards from famous and extraordinary games and legends of Gloucestershire including Mike Procter, Zaheer Abbas and Jack Russell are given a good mention. The book ends earlier in 2012 after Gloucestershire had held on to beat Hampshire which put them third in Division Two at the time. It did not last but this amusing book should please Gloucestershire and indeed county cricket fans in general.